A console at first glance that seems contemporary yet on closer inspection is much more timeless. The Sentient TIME WHEN console is our clearest expression yet of time and design. It has strong contemporary geometric angles and shapes that are harmoniously combined with beautifully grained American black walnut canted sides. The natural wood flows down the sides, like a waterfall, which softens the sharp sleek angular futuristic design. 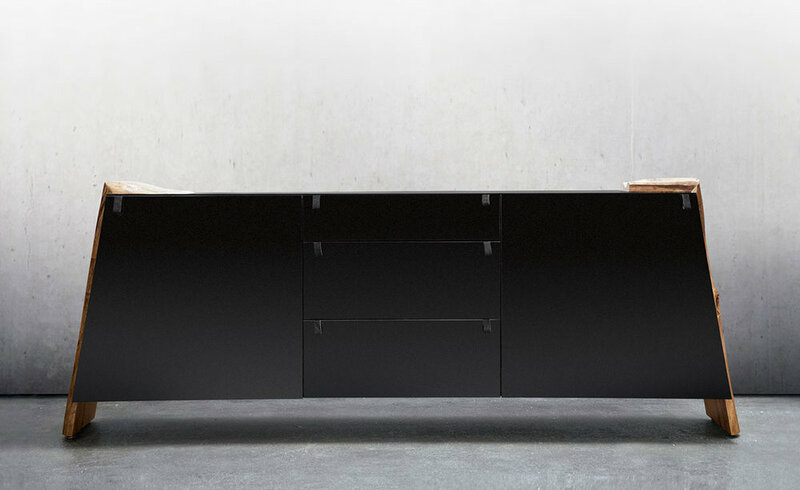 The TIME WHEN console is another original piece inspired by its older brother the SENTIENT LUXOR credenza. The Sentient Time When Console Materials is available in a variety of colors and material and shown in engineered solid core material with live edge American Black Walnut.